Facebook fans already know this, but I am in love with this top!!!!! It’s been a while since I made clothing for myself, but get ready for a whirlwind people. I was totally inspired by this top on Modcloth. I took Kathleen’s advice and perused some clothing websites before heading to the thrift store the other week. I was so happy the shirt I found was a size 16. That meant I could for sure make it into a maternity top. I’m not sure it will last all the way to the end, but it will go pretty far. And, when I’ve had the baby, I can take the sides in some and continue wearing it. *Sigh* So nice. 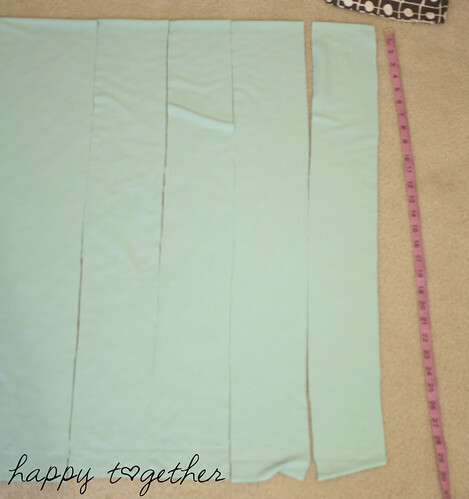 You will need a larger than normal shirt (I am a 6 and this was a size 16), extra fabric for the bottom (I used a knit so I didn’t have to finish any edges), velcro, felt, hot glue gun, and about a half yard to a yard of fabric for the belt. To begin, I cut the top off, making sure to have a tank top look to it. Make sure to leave extra around the edges to fold under to cover the raw edges. I just serged the edges of mine and rolled it down towards the inside once and sewed around the edges to hold it down. Then I shirred the back. This helps bring it in, but still gives me room for some belly growth. The Modcloth version is strapless, but I wanted straps. So I cut off the edges of the sleeves, leaving enough on the side I cut to fold under 1-2 times to cover the raw edges. Sew it in place after doing that. But, I just left enough for it to be folded over once since I serged the edges. Then pin the straps on where you like them and the proper length and sew in place. Now create a tube to go on the bottom to make it longer. Just cut a rectangular piece that is the same width as the shirts bottom, plus seam allowance. 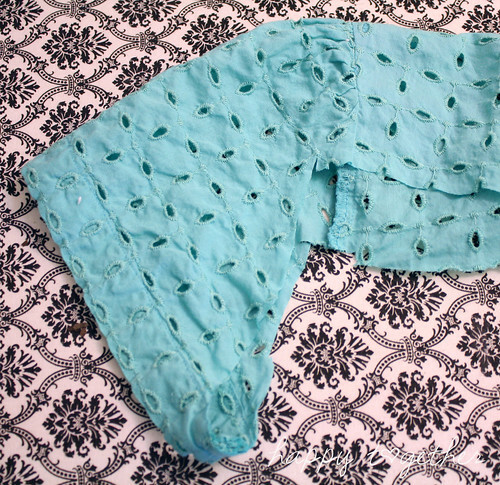 Then sew the sides together, pin on the bottom of the shirt, right sides together, and sew on. 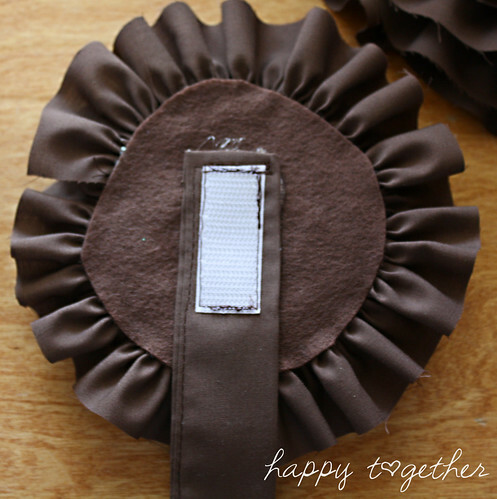 Then cut strips for the ruffles. However “tall” you want them to be is up to you. 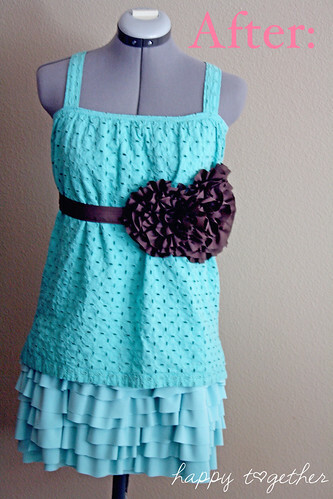 Try to double the width of the shirt bottom for the length of the ruffle. 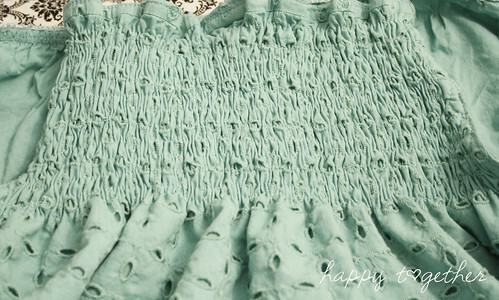 To create the ruffle, baste the top, then pull the thread that came from the bobbin to make it ruffle. 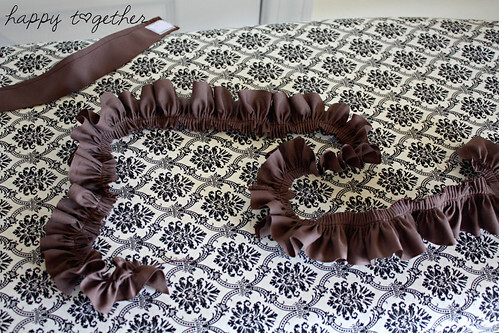 Have it ruffle enough go around around the fabric tube and overlap a little . Since I used knit fabric, I didn’t have to worry about finishing any edges. 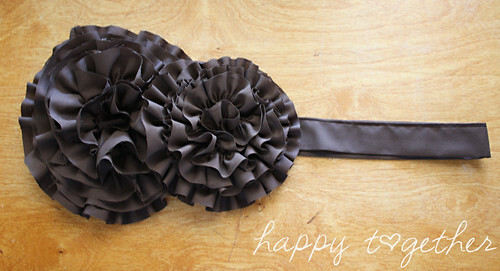 Here is a pic of the first ruffle going on. I would actually suggest starting at the bottom up to make it easier, but either way is fine. 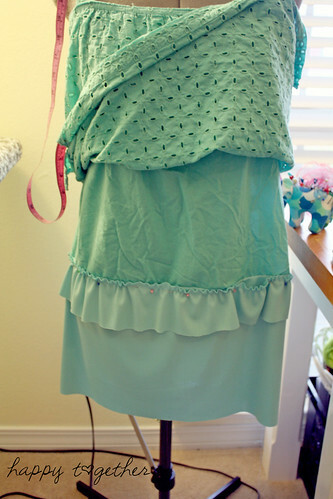 Continue to add ruffles until the fabric tube is covered. Start by taking the measurement of where you will wear the belt. I am wearing mine above my stomach, so I measured there. 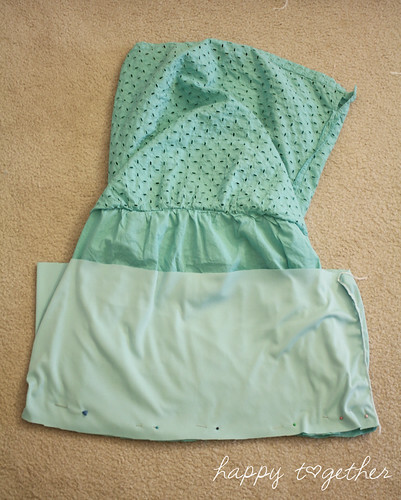 Then cut a piece of fabric that is the width of your measurement plus 2-3 inches. 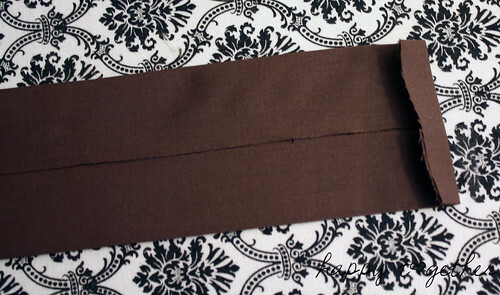 I made the height of it 4 inches for a skinny belt, but you can make it shorter or taller for a thicker or skinnier belt. Take your piece and fold it in half short ways, wrong sides facing. Iron. 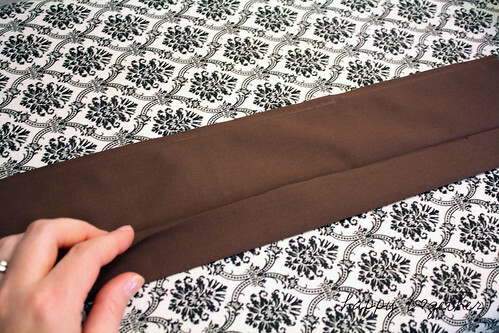 Open it up and take one side and fold it in toward the center crease. Iron. Now turn the ends in a little bit and iron down. Refold the piece on the original center crease and iron again. No raw edges will be showing. Sew around all of the edges that are open. Now cut out two circles for the flowers. Make sure one is bigger than the other. 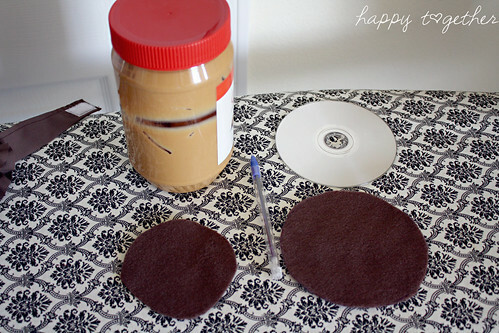 I used a cd and a peanut butter jar lid as templates for my circles. Now cut some long strips for the ruffles. I left mine with the edges raw. 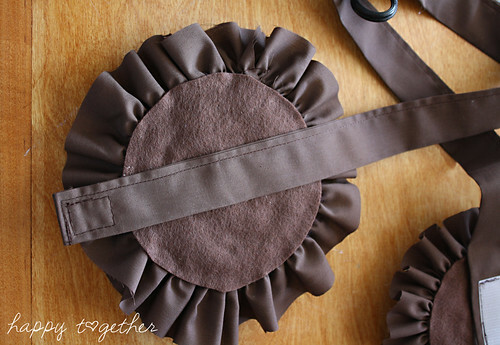 I also used a ruffler to make mine, but if you don’t have that sewing foot attachment, just baste and gather like we did earlier for the shirt ruffles. 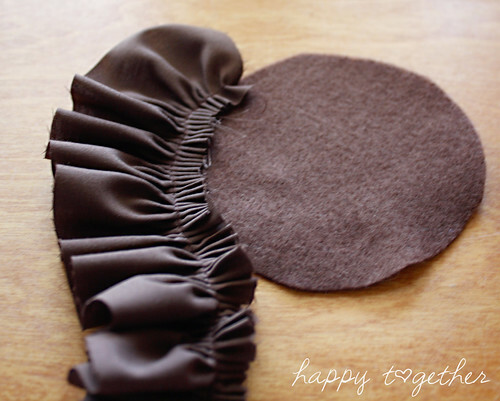 Using a hot glue gun, glue the ruffles around each felt circle. Start on the outside and work your way in. When at the middle, just tuck the end in. Then glue the little flower onto the front of the belt where the velcro is underneath. Make sure the velcro is in the middle. This will be the top closure of the belt. Then put the belt on and determine where to stick the second flower so it all sits properly. Glue in place. Now, this isn’t an exact science, but hopefully it will help you see that you can create fun modern looks in maternity clothing! Happy Sewing! I am totally in awe. Simply fabulous! 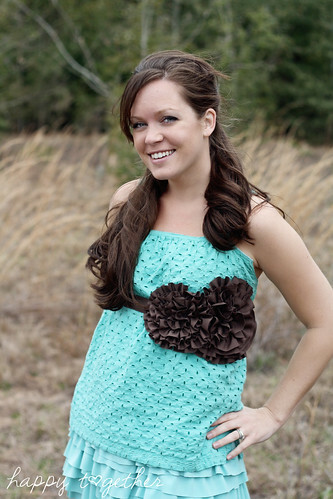 Wow, that shirt is really cute and I never realized that those rosettes could be so easy to make! Of course I say that before trying but it seems like I could figure it out! so cute! Much better than anything you can buy for less than a small fortune as far as maternity clothes are concerned. And how adorbs are you?! You’re like the cutest preggo ever. Very cute! I need to add this to my to do list! My belly is busting out of a lot of my regular clothes so now it’s time to get creative. Thanks for the tutorial! 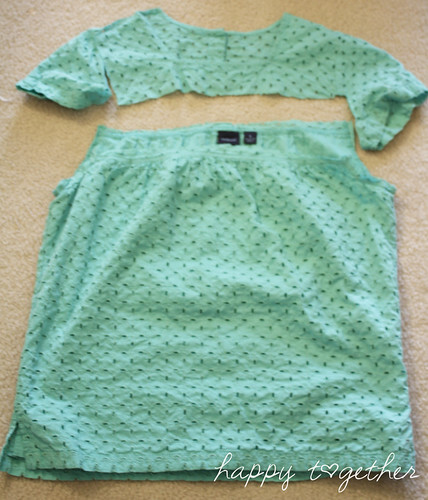 I love modcloth, your outfit, and those photos. Love your creativity, great ideas and inspiration as always! Praying for a very healthy baby…God bless! U look beautiful!! Great job!! Really impressive makeover!! Awesome and totally different design you designed here. It is such a very beautiful and looks very attractive, good to keep in drawing room. Nice idea…And you look perfect! Thanks for the great top idea! I’m about 3 1/2 months into my first pregnancy and am starting to think about some wardrobe changes. Very cute! I love this and would like to make one for my girls. This turned out adorable and I did a feature of it here Extreme Personal Measures. The top is adorable and you look LOVELY! The belt really makes it special, I think. 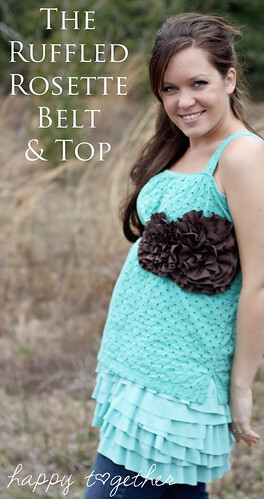 I love the top, I wish I was that creative when I was pregnant! I actually did the ruffles on the bottom by hand (basting and gathering). Then the other day I decided to figure out my ruffler foot and use that for the belt. I had it on 6. Ah! You are so cute, girl! LOVE this! And totally have an old shirt that my mom gave me with the same print. Seriously. I’m going to have to see what I can do to make something like this! Thanks for the inspiration! Oh yeah, and I’m doing a post about your Bachelorette Kit (and my take on it) later this week. Also, don’t know if you have a kindle, but sheet music was available for free last week. I totally snagged a copy!! Ok, I am in love too! It looks so cute! Beautiful top!!!! !and you are so cute!! 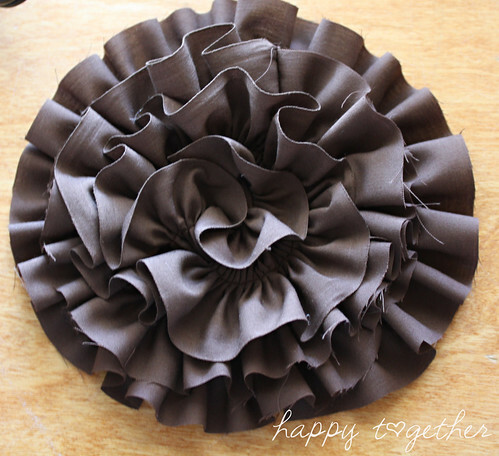 !Love the ruffled flower! hi, this shirt ist wunderful, great makeover! thakns for the tutorial! and you look so pretty! This is so adorable! Almost makes we want to be pregnant again! LOL Have you seen this site http://diymaternity.com/ Looks like they might have some good ideas! What a cute top! YOu are so talented. 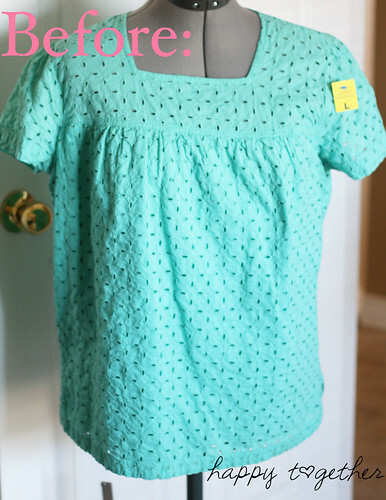 So cute – I wish I had your tutorial when I was pregnant, cute maternity clothes are hard to find! 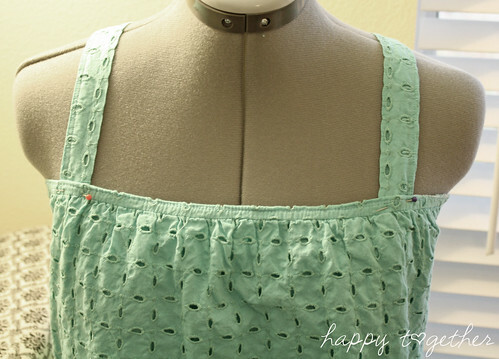 Speaking of sewing inspiration, have you found all the great projects and tutorials over at http://www.WeAllSew.com yet? Way cute! 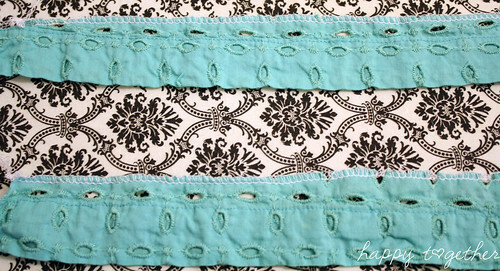 I have a belt fetish….and this one is super cute! WOW! I love this! I’ll be making that belt for myself and spreading the word as well.